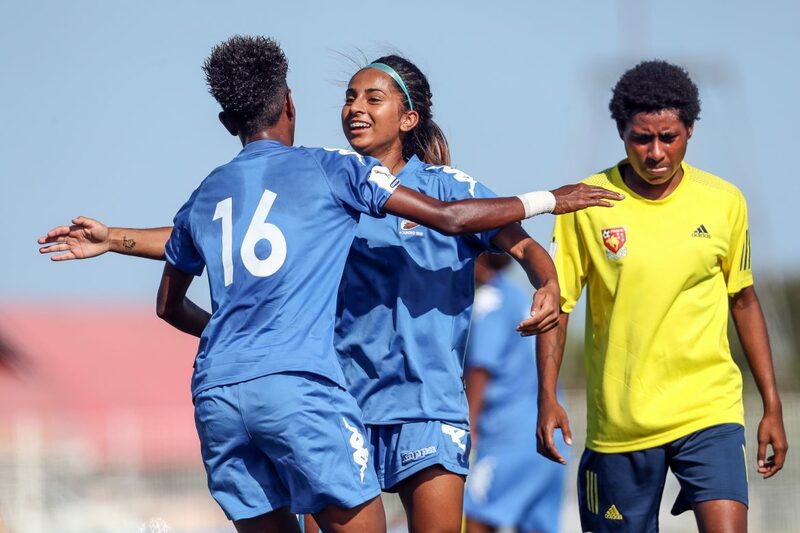 Fiji will make an historic first-time appearance in the final of the OFC Women’s Nations Cup on Saturday after seeing off match favourites Papua New Guinea 5-1 in a match that had it all at Stade de la Roche in Mare. They will face the five-time champions New Zealand who once more flexed their muscles by dominating their semi-final against hosts New Caledonia to secure an 8-0 victory. Both Fiji and Papua New Guinea kicked-off with a cautious approach to the opening exchanges. Despite Fiji’s early dominance, Papua New Guinea caught the Fijians off guard in the ninth minute with a quick counter-attack which saw Meagen Gunemba run behind the Fiji defence to put her side in front. That early strike had things looking like it was going to once more finish in Papua New Guinea’s favour, especially with Fiji having only ever beaten their Melanesian opponent’s once previously. However, Fiji’s American-based striker Trina Davis had other plans. Davis kept the Papua New Guinea backline busy as they tried to contain her speed, but she was eventually able to break them down and level the tie in the 23rd minute with a smart run in behind the Papua New Guinea back four to slot pass a helpless Betty Sam. Moments later Luisa Tamanitoakula evaded several Papua New Guinea defenders to put Fiji in the lead with a smart finish from close range. Fiji had an opportunity to extend their lead in the 34th minute when they were awarded a penalty, only for Cema Nasau to watch in disbelief as PNG keeper Betty Sam halted her spot-kick. Papua New Guinea made a concerted effort to pull themselves back into the encounter with captain Sandra Birum unlucky to hit the woodwork with a long range effort early in the second half. The game was still there for the taking for both teams up until the hour mark before Davis helped put the game to bed with a brilliant solo goal to make it 3-1. Cema Nasau made amends for her first half penalty miss scoring the fourth goal in style before Sofi Diyalowai grabbed a fifth late in the game. Fiji coach Marika Rodu gave credit to his players for their outstanding performance against a strong Papua New Guinea side. “Definitely we imagine that we can only improve football in Fiji, right now it is just only an infant,” the jubilant Fijian coach said. “Our structure is still young but to see these girls come out and prove themselves here in the region is quite amazing. “Secondly coming out of the qualification stage we didn’t expect to come all this way. “But now we are in this position we just want to give the glory back to God. His opposite number, Papua New Guinea coach Peter Gunemba congratulated Fiji for making it into the final. “Congratulations to Fiji for a very good performance and I would also like to congratulate my girls for coming through to the semi-final,” he said. “There were lots of things that we were not ready before came but we just want to thank God for bring us this far. “I didn’t expect the girls to play that bad today but it didn’t happen according to my game plan, the way I wanted them to play. Over on Lifou New Zealand coach Tom Sermanni was pleased with another professional display from his side from the outset. “I’m delighted again, especially from the way we started,” he said. New Zealand didn’t muck around or let their opponent settle into the encounter, with veteran midfielder Betsy Hassett tucking the ball into the net in the opening minute of the match. It only got better for the Football Ferns as their experience, pace and tactical prowess outshone that of their opponents. Emma Rolston netted the first of her hat-trick in the seventh minute, scoring twice more in the first half including one stunner of a lob from distance that had goalkeeper Lorenza Hnamano well-beaten. Katie Bowen was on the board in the 26th minute before Paige Satchell got one of her own in the 31st minute. Rosie White got the first of her two goals in the 38th minute with her second goal the only one New Zealand managed to get in the back of the net in the second half. Having an impressive afternoon on the pitch was young gun Satchell with her speed up the right causing no end of problems for the opposing defence, and if she wasn’t putting the ball on target herself, she was setting up her teammates to find the back of the net with pin-point precision crosses. The 20-year-old certainly impressed the Scotsman, and the crowd at Stade Hnasse, with an inspired performance. Finally, Sermanni felt it important to credit the Ferns semi-final opponent for an approach to the match which he felt was different to that of the teams which have come before them. “They came out here and tried to play. They tried to play a good brand of football, to push players forward and attack and went about the game differently to the other teams we’ve faced here, with a really positive approach. For New Caledonia, it didn’t quite go as they’d hoped with the initial aim being to prevent New Zealand from scoring early. That idea was undone when Hassett netted so early on, and it became about trying to control the attacks from New Zealand with a slightly higher than expected backline to play on the Ferns tendency to drift offside. Unfortunately, the hosts struggled to match their opponents in pace and when the Kiwis were able to stay onside, New Caledonia were duly punished. Coach Kamali Fitialeata knew it was going to be a tough match for his side but at the same time felt the first half wasn’t quite up to the standard he expected from his players. Fitialeata said nerves potentially got the better of his players, given they were taking on a team ranked 20th in the world for only the second time in the nation’s history. “They were a bit nervous, the block was far too high and the space in behind was free for New Zealand to exploit and that hurt us,” he said. “But this kind of competition will help us grow. We’ll learn, and we’ll keep trying to learn.